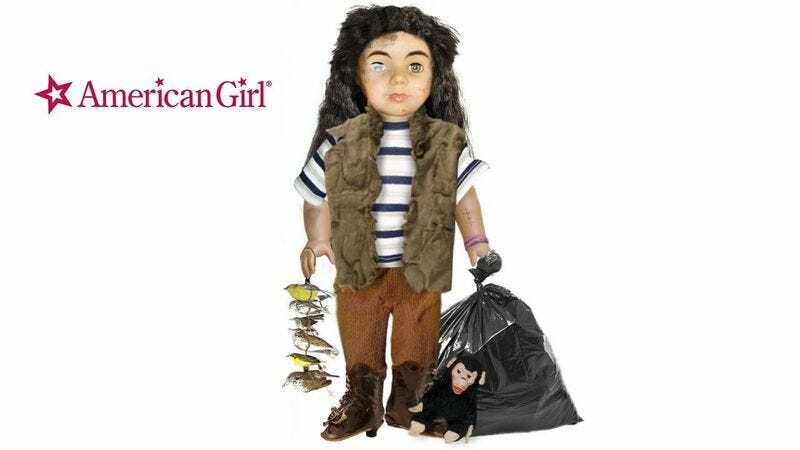 It’s an exciting day for little girls everywhere, as American Girl just announced its new doll: Gruncheon! A pale-skinned 9-year-old wearing an oversized giveaway T-shirt from a local bank, Gruncheon is an ornery hunchback who eats whatever accessories you give her and is always screaming about how badly she wants to guzzle milk. Following in the tradition of previous American Girls like Kaya and Josefina, Gruncheon is characterized by her self-sufficiency, as, having lost her family in a grease fire, she provides for herself by making sausages out of dead birds she finds and selling them to strangers. Gruncheon is unique among American Girl dolls in that she audibly breathes at all hours of the day, making her the first doll in the company’s history to feature a battery-powered capability. Sweet! Like all American Girl dolls, Gruncheon retails for $115, and there are also plenty of awesome accessories you can bring home with her (sorry, Mom and Dad!). There’s a tiara made of broken glass and frog legs ($26), a rusted old gurney for her to sleep on ($48), and her official companion animal, Cline, the bald chimpanzee ($32). And, of course, there’s an accompanying paperback chapter book that tells her life story, titled Gruncheon Knows All About The Sewer ($9.99). The doll is available for one year and one year only, so be sure to buy one for your daughter or niece before Gruncheon retreats to the shadows for good.